Aux Input, body coloured rear spoiler, central locking, daytime running lights, Electric heated body colour door mirrors with side indicators, electric front windows with one touch opening and closing, engine immobiliser, tinted glass and tyre repair kit. 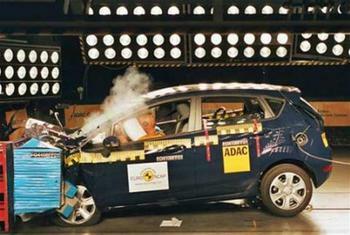 The new Ford Fiesta has received a 5 star Euro NCAP rating, this is the highest rating given by Europe’s leading independent safety organisation. This excellent safety performance was down to the active city stop, emergency assistance and sync. This is a great example of ford’s commitment to safety and has helped them to achieve a total of 6 Euro NCAP advanced rewards all for innovations to protect its customers. There is a total of 7 airbags in the new Ford Fiesta, which includes even one to protect your knees. The new Ford Fiesta is one of the safest cars on the road today. 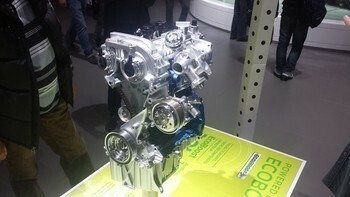 The new 1.0-litre EcoBoost 3 cylinder leading petrol engine gives you all the power you could expect from a normal 1.6 engine but uses 21% less fuel. This means a huge saving at the petrol pump. The innovative 1.6 TDCi, produces around 95 PS with auto start stop achieves a class-leading 85.6 mpg, with CO2 emissions as little as 87g/km. Alternatively, the economical 1.5 TDCi outputs 75 PS, keeps fuel consumption at an amazingly low level of 76.4mpg and CO2 emission levels at 98g/km. Combining the ease of an automatic with the control of a manual, this six-speed, dual-clutch automatic gearbox pre-selects the next gear for the driver, so you don’t lose any power at all when you change. PowerShift’s super fast, seamless gear changes not only make driving smoother and more exciting, but also save fuel and lower CO2 emissions compared to the normal automatic. Both engines, the 1.25 petrol and the 1.0 litre EcoBoost come with the 5-speed manual transmission, adjusted and tuned to match the characteristics of both engines. Inside a new Ford Fiesta is a great place to be, with new glossy touches, a new two way steering wheel adjustment and also a decent amount of seat adjustment. You can say goodbye to plugging your keys in as well because of the new Ford Fiesta power starter button. The new leather covered handbrake gives a satisfying touch of premium for your money, along with the new aluminium pedals. There is also the new fiesta ambient lighting to marvel at when you’re driving in the dark, but we’d rather you keep your eyes on the road. The new ford fiesta has returned with a fresh new look, with the newly designed front grill and headlights and also sports new more prominent wheel arches. Ford have tinkered with many different aspects of the exterior design, like the new rap around rear headlights, the innovative new fiesta halogen projector headlights with LED light and the very stylish new trapezoid grille. And now to the colour options, the fiesta candy blue metallic is currently the most popular colour in the car. Followed closely by the hot mustard metallic, which is basically gold metallic with a British twist and you get hot mustard and customers love it. Ford has cleverly priced the colour options, with the candy blue the most expensive at £725. Other metallic colours are £495, while the least popular solid red is free. But with solid white getting more and more popular they’ve slapped a £250 price tag on it. The wheel options are vast, with 3 different Wheel covers, 7 different alloys and all ranging from 14 inch to 17 inch. The new Ford Fiesta is bursting with technology and has been described as a giant iPod, having said that its technology is very impressive. 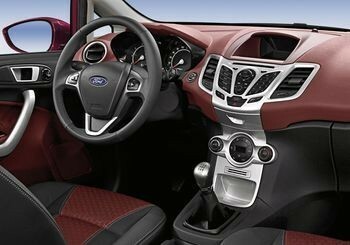 It benefits from voice activating controls, Bluetooth and the new Ford sync technology. Ford sync lets you access your music, phone call and music by using simple voice commands. This is ideal unless you feel a little bit silly talking to a Ford Fiesta. It also reads text messages for you, which allows you to keep your eyes on the road while your car tells you what’s for tea. Although this does set you back £200 on some models, it is definitely worth the investment if you utilise it right. 5 Ford Fiesta Titanium are available at UK Car Discount! Click here to see our Ford Fiesta Titanium offers.